Winter has well and truly arrived. We had a pretty mild December and January but the wind direction has swung round and now there is a bitter chill in the air. Add to that the grey sky and short days and my body is screaming for hearty food. The good thing about comfort food is that it’s usually very simple to make… and leftovers invariably taste better the next day! Take baked beans. For many years I couldn’t see their appeal. To me they were mushy, sweet and bland. That changed when it dawned on me that I could make my own. Strangely enough, this only occurred to me recently even though I have made fava, cannellini beans and chickpeas in a vegetable sauce for years. I suppose I was just so underwhelmed by tinned baked beans that I never saw any reason to make the real thing, until one day I ran out of fava and chickpeas. The recipe couldn’t be simpler. Simply cook the beans in a vegetable stock for about 30 to 40 minutes, boiling for the first 10 minutes and then turning them down to simmer. Then strain off the stock. Chop some tomatoes and garlic. 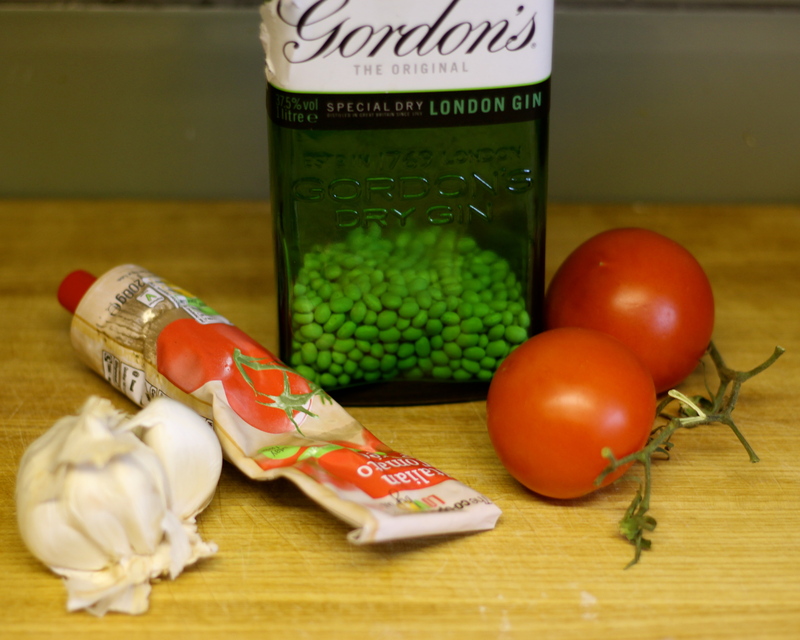 I use three or four tomatoes and two cloves of garlic per tea cup of beans, but quantities really aren’t critical. If you have any, add a good squirt or dollop of tomato puree (i.e. about a tablespoon) as well as salt, pepper and a generous sprinkling of mixed herbs, and cook it on a medium heat for another 20 to 30 minutes. If you don’t have herbs to hand, you can add a paprika, Tabasco or even Worcestershire Sauce. I use dried beans because they are cheaper, contain less salt and avoid unnecessary waste, so the ‘hardest’ thing is to remember to soak the beans the night before. Often I will boil the beans in stock whilst I’m getting ready in the morning so all I need to do in the evening is cook them in the tomato sauce. 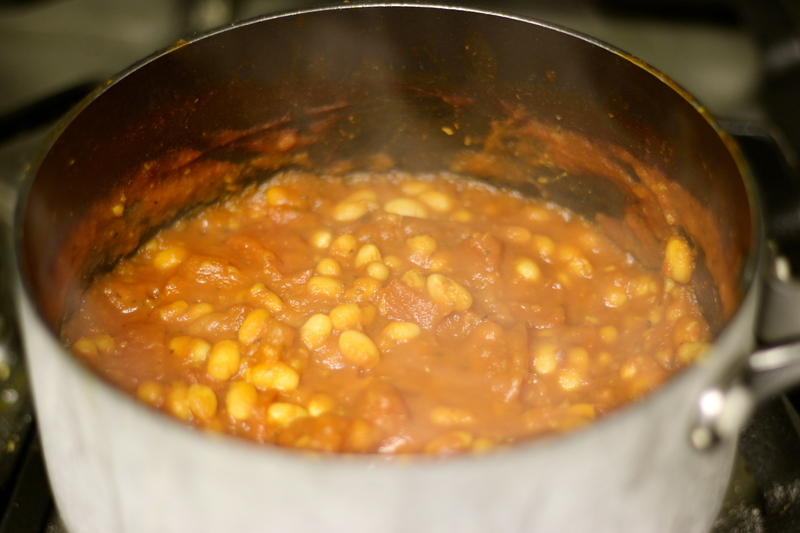 If you are using tinned beans, just add the tomatoes and seasoning (but no salt) and cook for 25 minutes. Just remember the beans will be more mushy due to their extra long soaking in the tin so don’t overcook them. I could serve the baked beans with eggs, or a couple of rashers of bacon, but they are so tasty and filling that I treat them as the main feature, with a slice of homemade bread or sautéed potatoes. I particularly recommend tossing leftover potatoes in a little olive oil and paprika before gently frying them. Another real comfort staple is gnocchi. I’m not talking about the hard potato pillows you find in the refrigerator aisle of the supermarket but of smooth yet crispy semolina gnocchi baked in the oven. Semolina* is the middling of durum wheat (the grain used for pasta). These days many view wheat as ‘evil’, probably due to the abundance of poor quality white bread and too many pastries. Wheat, however, like many other grains is highly nutritious: high in fibre, protein and vitamins (especially the B group) and minerals. Middling actually refers to the those parts of the wheat kernel that are nutrient rich but generally discarded after milling because the food processing industry prefers white flour. The recipe I use may sound a little involved but as with baked beans, it can be broken down into separate sections to suit your schedule. And as with most of my cooking, it’s not critical to measure out exact quantities! First melt a tablespoon of butter with about 375ml (3/4 pint) of milk making sure it doesn’t boil. Turn Take note of the time and then gradually add 125 g (4 oz) of fine semolina over a low heat, stirring all the while. The grain and fluid will congeal into a ball that looks like fluffy mashed potatoes. If it looks lumpy, just add a little more milk. Keep stirring for about 6 to 10 minutes in total. Some recipes suggest you should stir for as long as 20 minutes but I’ve never found this necessary. Take the pan off the heat and let it cool for a few minutes. At this point mix in a good tablespoon of grated parmesan or similar cheese, one beaten egg and a grind of pepper. Spread the mixture on an oiled baking sheet or large plate. I usually start with a knife and then used washed hands to press it out till it’s about 2.5cm (an inch) thick. Chill the semolina mixture in the fridge for at least 20 minutes but it is fine to leave it for several hours if necessary. Then cut out rounds (using a small pastry cutter) or triangles and arrange them in a well buttered baking dish so they overlap. Press any offcuts into a ball, flatten it out again and cut more shapes. I generally get about 16 rounds out of the mixture, which fit snuggly into an 20×15 cm (8×6 inch) pie dish. Dot the gnocchi with a little butter and sprinkle a couple of tablespoons of parmesan on top. You can definitely increase these quantities if you like your meals super rich and creamy! Finally grate a little nutmeg over the top if you have any and bake it in the middle of the oven at 180C/350F for 20 to 30 minutes. I generally serve gnocchi with a tomato sauce – just use the baked beans recipe minus the beans – or with kale sweated in garlic, oil and a little water for a light supper. If I’m out of parmesan, I might use goat’s cheese or even a blue cheeze like gorgonzola. And for a more substantial meal I serve it as a side with a rabbit or pheasant ragu, or even Mr M’s goulash. The above quantities serve two to three people and can easily be increased for larger parties. If this sounds like a lot of work for one meal, leftover gnocchi will keep for a couple of days. I regularly serve up leftover gnocchi, either reheated in a little oil or mixed with a ratatouille for an impromptu vegetable bake. Although comfort food like baked beans and gnocchi may not sound very exciting or stylish, they are a bit like a good black cardigan: a cosy staple for cold nights that can easily be dressed up with a few spices, a tablespoon of unusual cheese, some quality sausages or a little mince and garlic! * Semolina is readily available in the UK these days but if you need to ask a shop assistant, indicate that you are looking for the cooking grain rather than the sweet puddings. 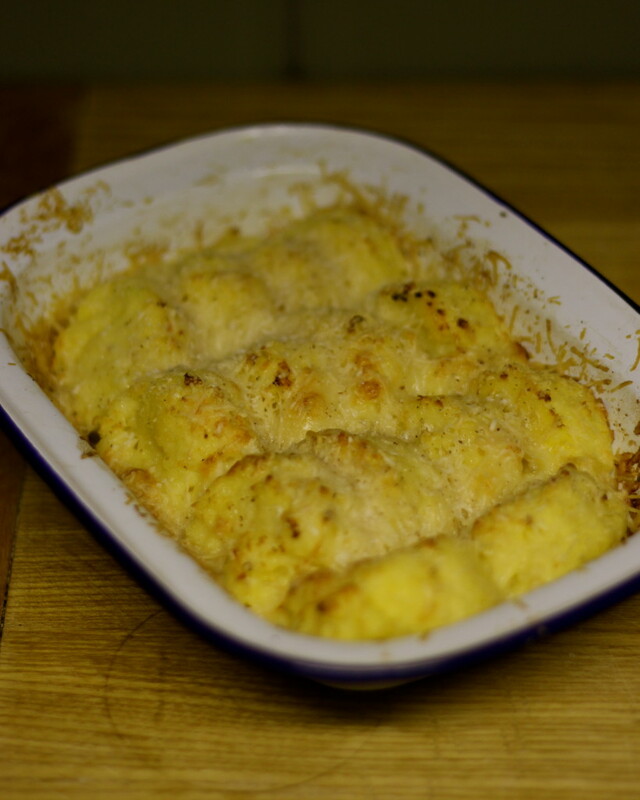 Semolina gnocchi are obviously not dairy-free, gluten-free or vegan-friendly. I’ve not tried to make them without milk, butter or eggs as in my experience, the best vegetarian, vegan, gluten-free… food is food that celebrates fruit and vegetables rather tries to recreate (usually European) dishes that derive their taste and texture from eggs, dairy and/or gluten. If however you want a similar starchy side with a slight crunch, I would recommend using polenta (the maize/corn equivalent of semolina) or even millet. By boiling these grains with water you can make a porridge that you can spread and chill like semolina and cut into triangles or squares. Rather than baking them in the oven, fry them with a little oil on a griddle. Yum! I made real baked beans for the first time last year, and loved them. I ate them breakfast, lunch, and dinner! I’ve never had this type of gnocchi — must try. My latest bean dish was a giant kettle of pinto bean chili. I think we’ll be eating it for the third time tonight 🙂 I will slice some avocado over it for a little change from how we’ve been eating it (with homemade cornbread). Aren’t baked beans a superb example of how much taste our society is prepared to sacrifice in the name of convenience! Corn bread… I must try my hand at that, since discovering them in an Argentinian restaurant. I suspect corn-based breads are more common in the US than Europe due to the big corn industry and the influence of Mexican cuisine.